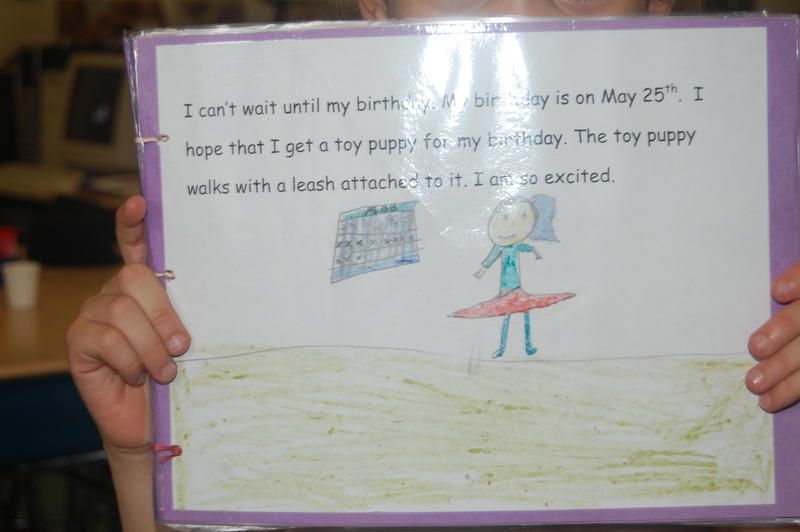 ThePictureBookPusher Publishes her First 20 Picture Books! 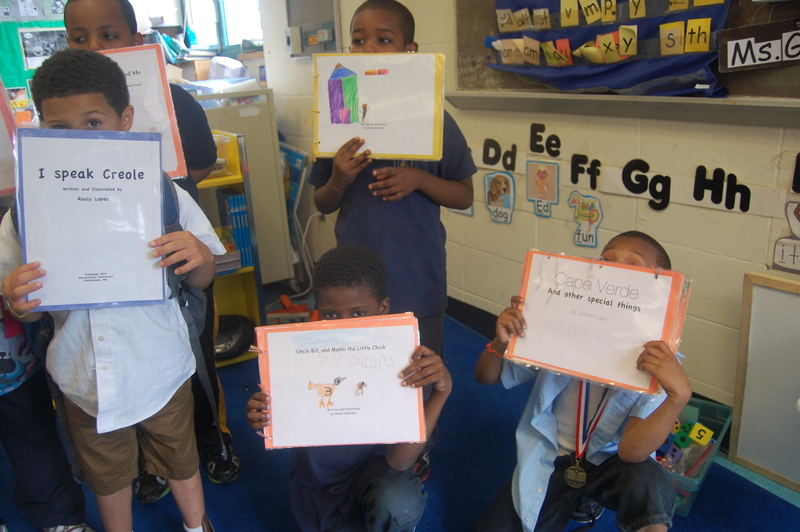 A.K.A all twenty of my students posed for a picture holding their prized original picture books. 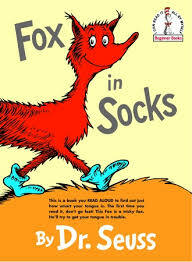 Written by them, and edited and published by The Picture Book Pusher. The theme was…..no theme! 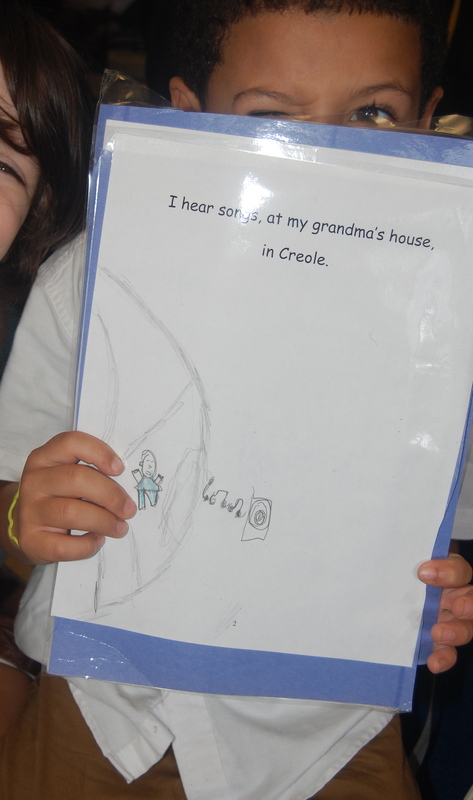 The students chose their story line, and genre. As long as they could identify the genre of their story in writing, and include an epilogue at the end of their book, they could create as they please! Let’s take a moment to admire their illustrations. 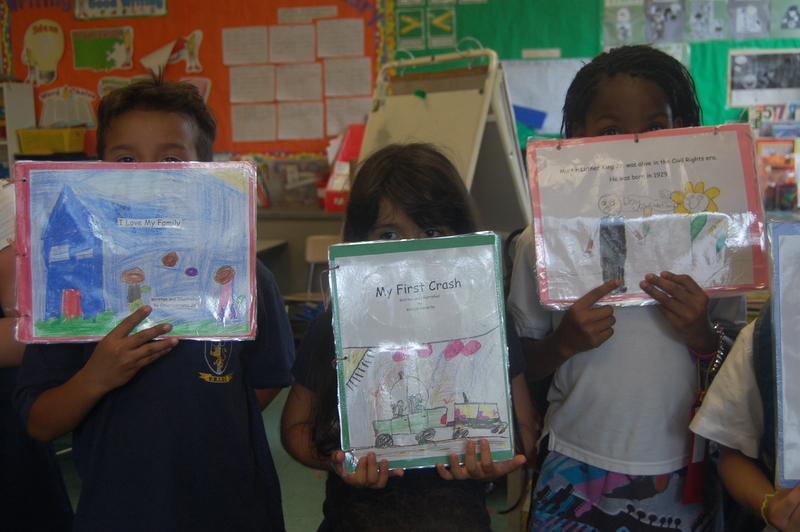 First I asked the young authors to hold up their front covers. 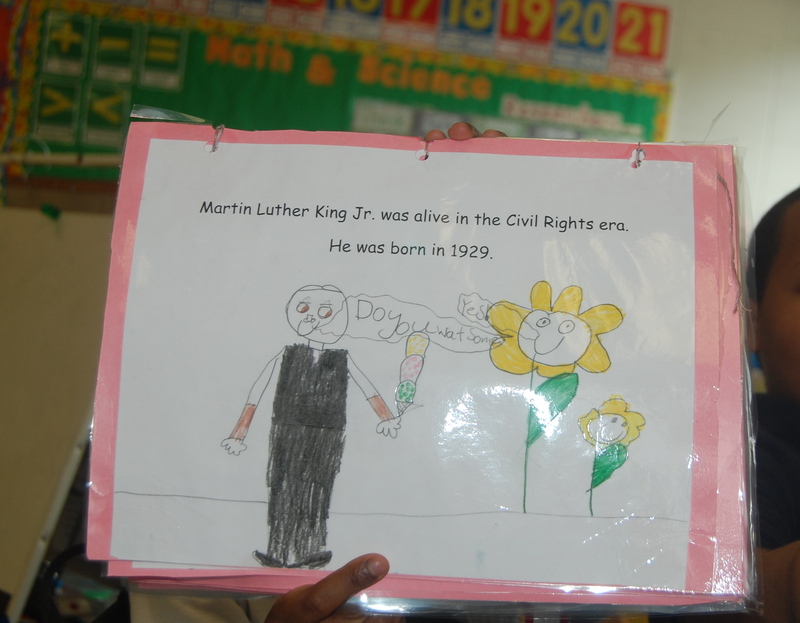 Here’s a sampling of my first-graders’ artistic flare. 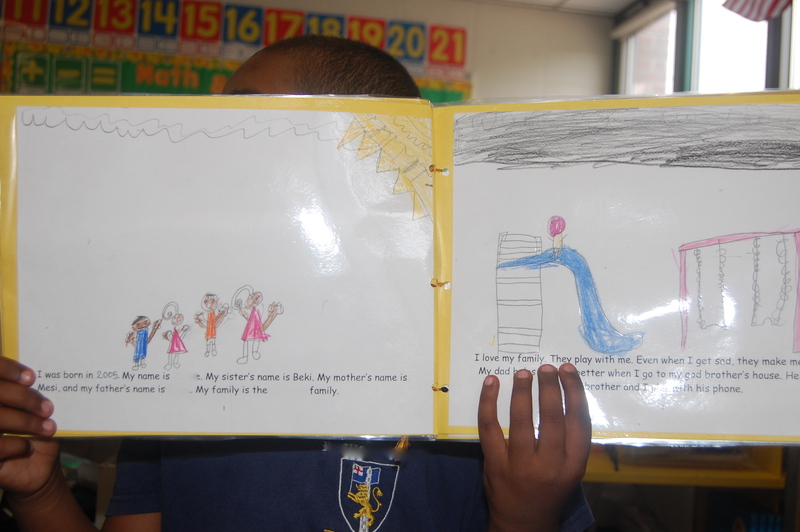 Then, I asked the students to please hold up for the camera, an illustrated page they are most proud of. What I love best about the above drawing, is the illustrator’s ability to illustrate the words, “but my Uncle Bill does not do only that”. 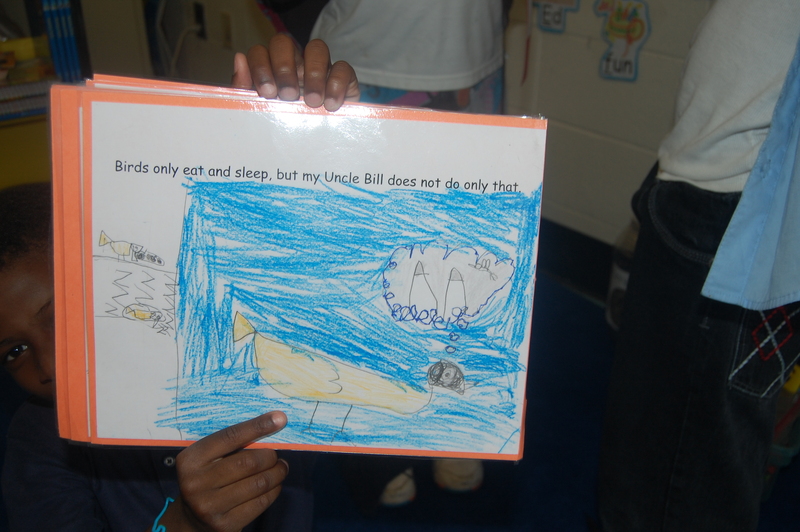 Notice the large colored-pencil-portrait of ‘Uncle Bill’ the bird. 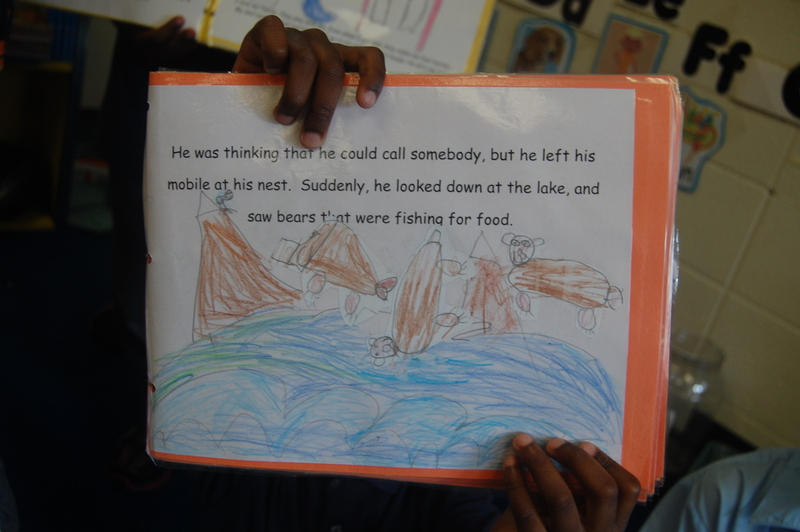 It portrays Uncle Bill thinking of his adventures; building suspense in the reader via visuals. The stark contrast in size, between all three bird drawings above, allow the reader to feel a sense of greater significance in Bill’s yet-unmentioned, “not only that”s in comparison to his “only eat”, “and sleep” habits. Though both habits are illustrated as well, the drawings are small, yet detailed, in the left-side margin of this page. First you see the miniature ‘Uncle Bill’ eating what looks like a Boom Box, but is really some bird food surely. Below the hungry ‘Uncle Bill’ is, Uncle Bill catching some zzzzzz’s. Amazing. The name of his story is, Martin, Obama, and Me. I must admit, that I am in love with this story. This student entered my classroom in the Fall with a lot of embarrassment and disconnectedness to his heritage and beliefs. His family are refugees from an African nation. This student had to tell me everyday that he is not African, and that he only speaks English. He was embarrassed to be different, even though there were other students from other African nations in our class. 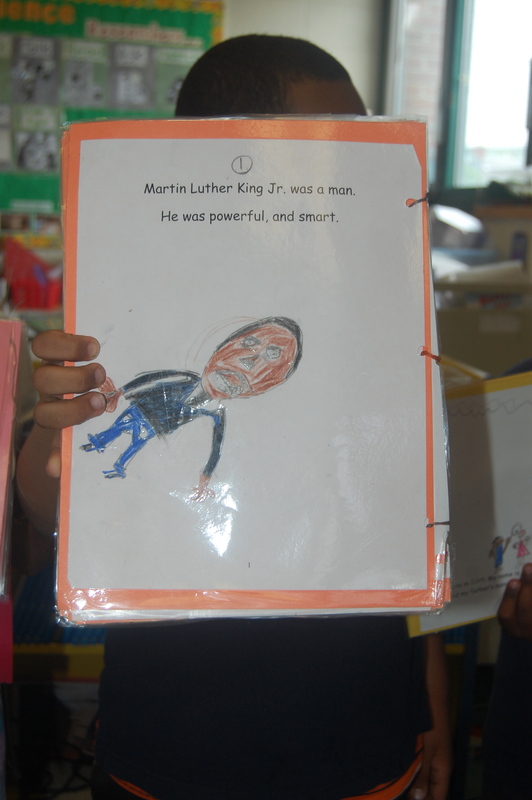 With the right Social Studies curriculum, picture books, and the utmost mindfulness, this student is now super super super proud to learn about other African-Americans, and reps Africa like no other. He now teaches the class on his family’s country’s culture. During snack time, he brings students over to the map, and talks about Africa, and writes words for them, in his mother’s native tongue. Again, I did not guide the children into choosing certain story topics. 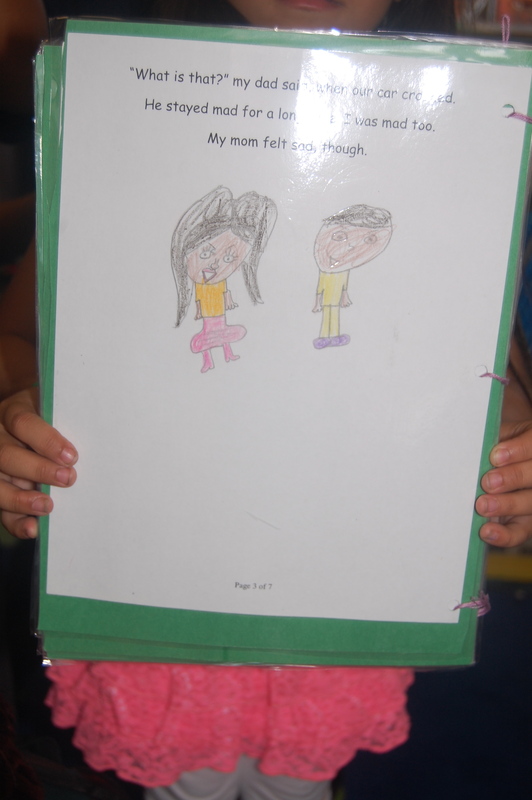 I also let this student know that he didn’t have to write about a person he learned about. I apologize for the glare. Don’t you just love the spiked hair on the boy holding the flower? My favorite element to this illustration is the horizon of flower buds up top. 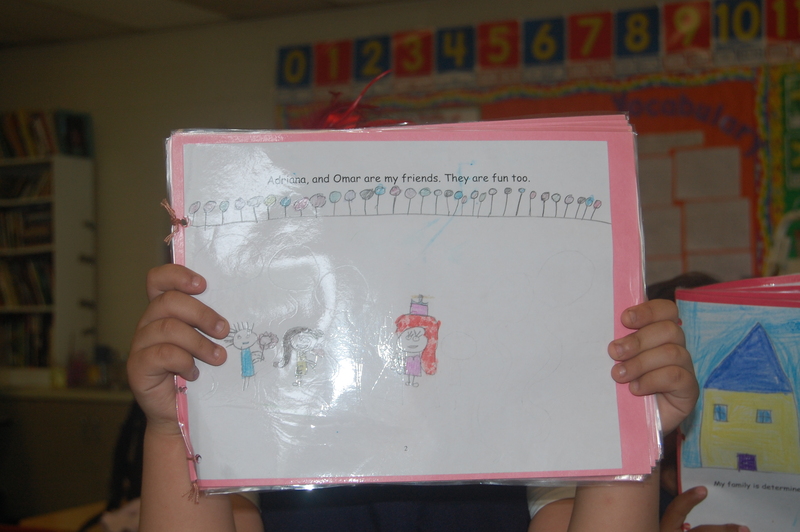 Cheerful effect, letting the reader know that ‘Omar’ and ‘Adriana’ are indeed good friends to have. Here are some more illustrations, without the scripted breakdown of my favorite parts and such. 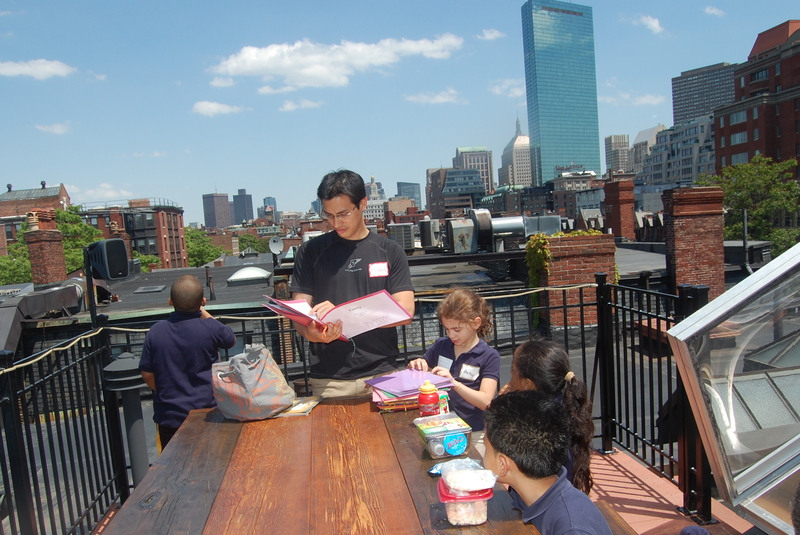 Below is a picture of Playmaker Rolland with one of the student’s stories during our roof top lunch! 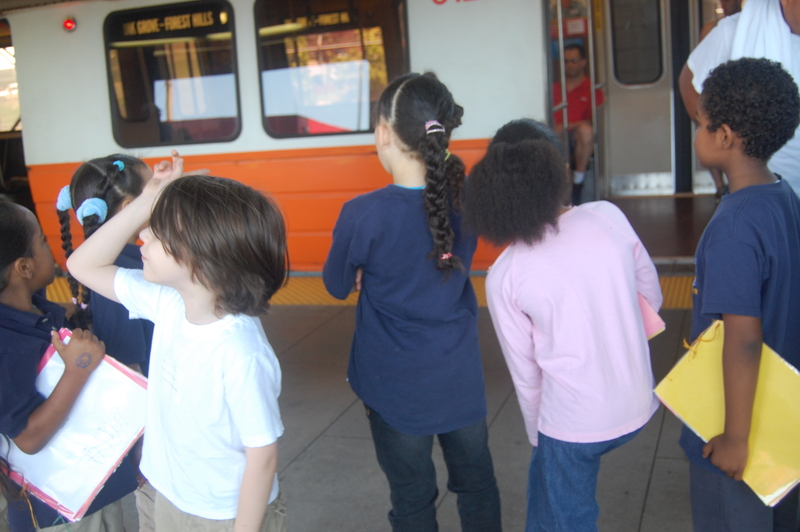 Not only did my students travel almost 4 miles, pedestrian style, with their picture books in hand, to visit the Playmakers for lunch…. *amusing disclaimer: The 4-mile trip on foot, does not include the distance we traveled by train. We did in fact walk 4 miles round trip. So proud of these kids! 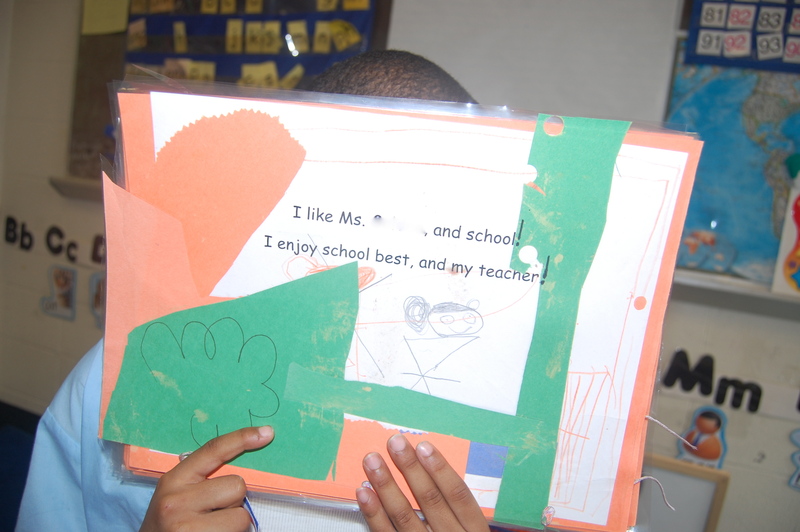 Thank you for reading another post by The Picture Book Pusher. ” Although it may be unintentional, most mainstream U.S. educators have been made to believe that the cultural and linguistic norm of their background is to be maintained… (Farr, 1991). Such ethnocentrism needs to be replaced by an ethnosensitivity…” – (Yokota & Teale. The Administration and Supervision of Reading Programs. 2000). 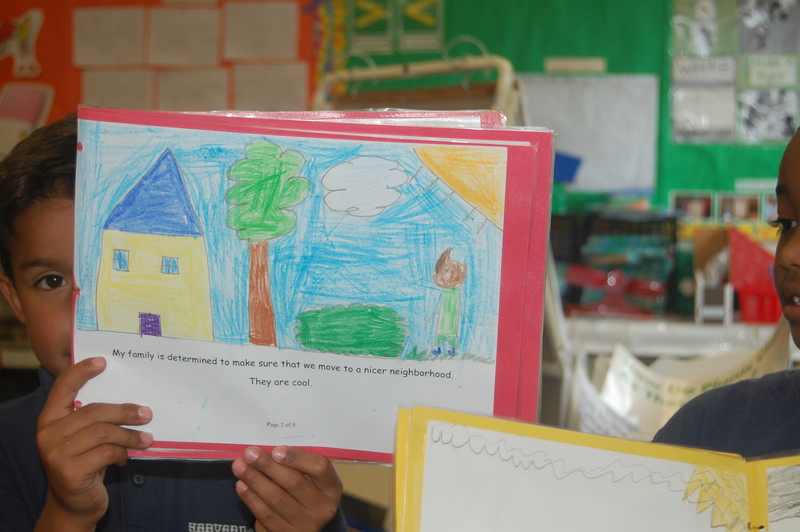 As a first-grade teacher, in an urban school district, I pay critical attention to the literature my students are, or may be, exposed to. I agree with the above quote. As a collective, we educators need to replace our ethnocentric methods of instruction, with methods that are ethnosensitive. If we do not evolve in the ways that we need to, in order to truly be highly qualified teachers, then we will continue to propagate our classrooms with cultural mantras that obstruct the majority of our students from achieving their full potential. 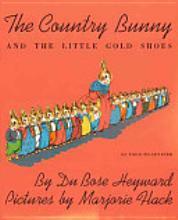 No other storybook, that I know of, embodies this ethnocentric propaganda quite like the picture book, The Country Bunny and the Little Gold Shoes, by DuBose Heyward. 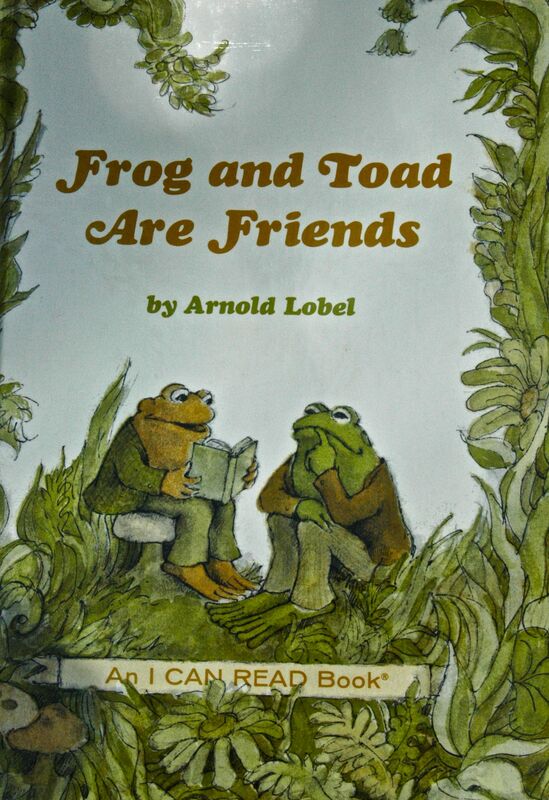 A book that is still read to children in Early Childhood classrooms, in the public and private sector alike. I do not read it in my classrooms. I was first introduced to this story almost exactly one year ago. While working, for the day, in a K1 classroom. 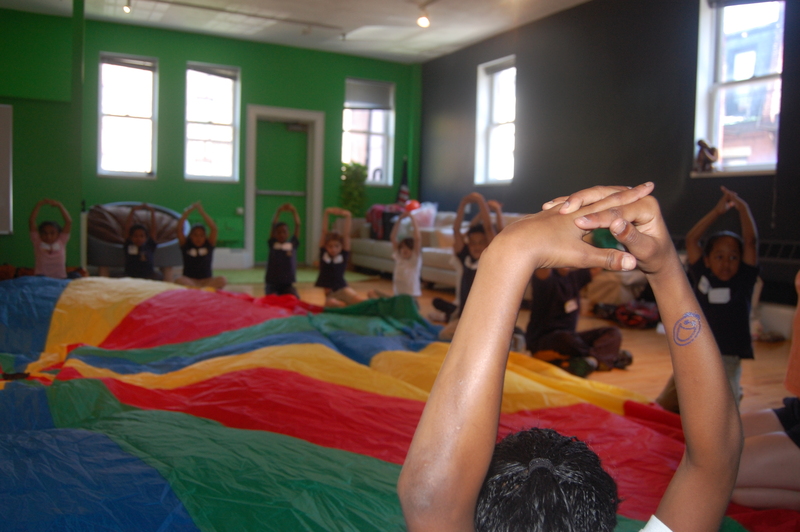 K1 is what we, in the education field, term students who are roughly four years of age; a year before entering Kindergarten. 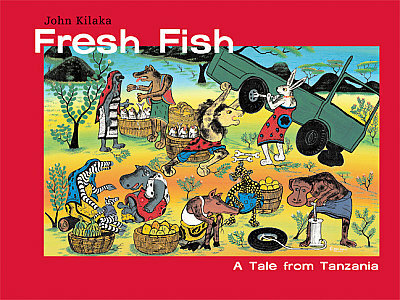 That day, in the K1 classroom, I was left a note by the head teacher, asking me to read this book to the students. Since this time, I have come across the book in two other classrooms, on display, ready to read to students in grades K2-Grade 1. Public schools. Its allegory is oppressive. Its relevancy to today’s classroom is null. I’ll summarize the story for you, below. The story begins, introducing us to the main character, Country Bunny. She hopes to be chosen as one of five Easter bunnies. The five Easter Bunnies are chosen by the wise old Grandfather Bunny. 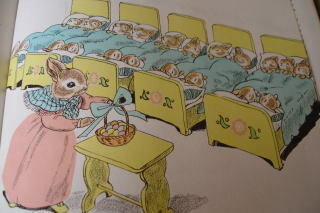 The story continues with Country Bunny growing up to have twenty-one little bunnies to care for. The story continues with Country Bunny living in the country, raising her twenty-one children to be hard workers, that keep a very tidy house. Then one day, she decides to again try out to be one of the five Easter Bunnies. Country Bunny doubts her ability to compete against the other bunnies who are also trying out their skills for Grandfather Bunny. The following pages go on to tell us how Grandfather compliments the other bunnies’ beauty again, and then sees Country Bunny and compliments her on raising so many well behaved bunnies in a small country cottage, and how happy they must all be. The word ‘kind‘ is consistently used to describe Grandfather Bunny. 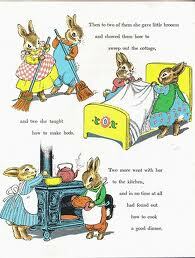 The words, “well-trained” are used to describe Country Bunny’s many children. Alas, Country Bunny is chosen as the fifth Easter Bunny. Thus, she leaves her children to dutifully tend to their cottage house while she goes off to work for a short time, during the Easter Season. So Country Bunny, and the other Easter Bunnies, all disperse from the Palace with Easter eggs to deliver to children all over the world. Up until this point in the story, all images are of bunnies, in their bunny world. This theme continues throughout the illustrations. We are shown images like those below. Four pages of these images in fact. 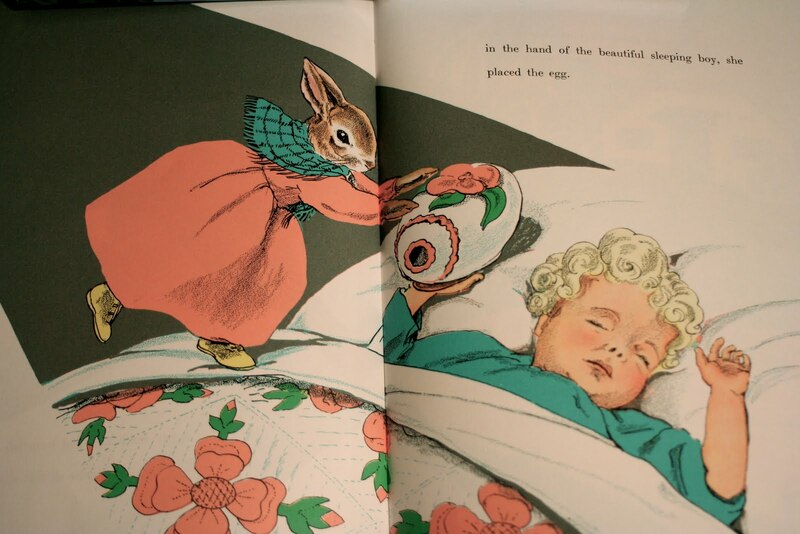 Images coupled with words that tell us how difficult the conditions were for Country Bunny, as she tried so dutifully to deliver the humungous special egg that is for one particular child. Grandfather chose Country Bunny specifically for this mission. Then the journey becomes too difficult for Country Bunny. She loses hope. 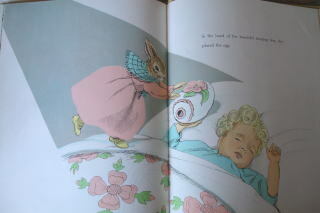 She collapses under a tree, where Grandfather Bunny suddenly, and magically appears. He tells her to have faith, and that he will give her a pair of magic golden shoes, that will aid her in her journey to deliver the egg to the child on the top of the mountain. At this point in the story, there is so much build up to the climax. So much anticipation, in what is in store for Country Bunny. She perseveres. And alas, she arrives to the Easter egg recipient’s house up high on a hill. In the image above you see Country Bunny being propelled up the mountain by the magic golden shoes. Alas, as the reader turns the page, we see……. Only time the word beautiful is used in this book, it is referring to the large, random, single image of a human child. Pale skinned, and blonde haired. Country Bunny’s important mission is complete. We are never told what the boy did to deserve such an egg. We are only informed of his beauty. Thus, being well-deserving of Country Bunny’s volunteer service. Okay, here’s where the shift in conversation comes. Many can debate that even if the story is provoking stereotypical perceptions of American beauty, it does not mean that the story does not also speak of heroism, and determination, and the ethical stand-point that if you work hard and believe in yourself, your dreams can come true. After all, that is what every other blog or review of this book is saying about this book. Here are two quotes that I came across online. I critiqued this story from a different perspective than the two reviews above. This is how the rest of the story plays out…. So what we are learning here, is that the hard working country bunnies only deserve a little basket of eggs, that the generous wise, kind, Grandfather bunny was gracious enough to share with Country Bunny for her service to the well deserving beautiful white child. Disproportion at it’s most blatant. Oh but wait. It gets “better”. The story ends not like that of Cinderella, with a grand life ahead of her. No. Unlike Cinderella, Country Bunny’s humble, and dutiful portrayal does not contain an element of beauty. Not once does the story refer to Country Bunny’s aesthetics in a positive way. 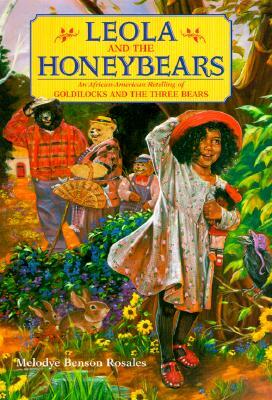 Nor does the book refer to Country Bunny’s traits as that of a bunny – the author describes Country Bunny as having “Brown skin” and the white bunnies had, “pretty white fur”. No encouraging adjectives included. Sure one can argue that the book influences young minds to be dutiful, humble, and strong, but at what price are we teaching them this? One that presumes females with brown skin will be content in subservient roles. That day, in the K1 classroom that I was working in, there were about 19 students present. About 1/5 of the class was caucasian. 1/4 students from the Congo, Somalia, or Kenya, living here now as Americans, but also as refugees. A few of the students were beautiful brown girls who wore Khimars, and others African-American, as well some from Latin American countries. I was expected to prescribe them, collectively, with that piece of literature? Good gracious, I couldn’t dare. When I brought these facts to the head teacher’s attention, she was defensive and said that she had been reading it for years. Another teacher in the same school had the book out. I pointed out the oppressive aspects of the book. She said that she hadn’t noticed that and thought of the story more as a feminine heroic tale. However, she also thanked me for pointing out the racism of the story and said that she most likely will not read it in her classroom anymore. 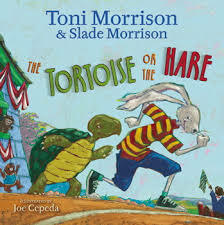 “Lyrical writing, glowing illustrations, fuel for the imagination, a sense of humor, and, of course, a message: plucky little girl bunnies who defy prejudice and believe in themselves can grow up to become fully actualized lady bunnies who raise smart, happy, kind children and do fulfilling work outside the warren.” – The NewYorker 2010. If a tale of feminism, portrayed by talking rabbits, is the claim of value, fans of the book use as their reason to continue to read this in the classroom setting, then why not try some more effective and purposeful titles? Try Nina Bonita by Ana Maria Machado. Illustrated by Rosana Faria. 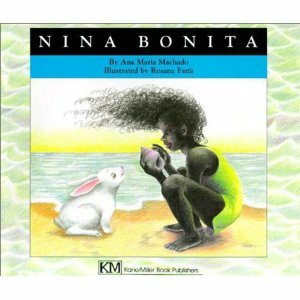 In this delightful tale, first published in Brazil, the young white rabbit hopes to grow up to be as “pretty and as black as she”. The rabbit tries all sorts of ways to turn black, to no permanent avail. Thus, the story ends happily because the young girl Nina, introduces her little bunny friend to a beautiful black bunny, and they end up having bunnies in every shade. If you look closely at the cover of this storybook, you see a white jack rabbit lifting up a car. The rabbit is female, and is not the main character, but is the one in the bunch who repairs everything and remains calm, throughout the story, including when they get multiple flat tires. The characteristics of the rabbit are not illustrated to be anything out of the norm. It just happens to be a female rabbit. I have yet to come across, online, any other review of Country Bunny and the Little Golden Shoes , that illustrates it’s cultural biases and limitations in an accurate way. 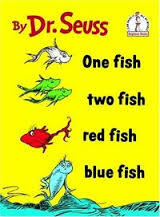 Most people praise the book as a gem, a childhood favorite. 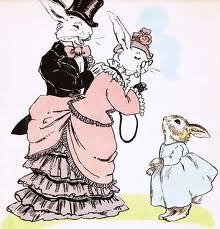 Many people it seems, are viewing this book from the viewpoint of the “fine white rabbits”. I could go into much greater length of the implications of this story, (that’s almost a century old), being read in an urban public school classroom of today, or any school for that matter; but I will go into it at greater length via another outlet, at another time. This book very well may be being read in a school near you. I see it with my own eyes. Some teachers understand my imperative perspective on this book, and some do not. I am thankful, that most of the book stores I have asked, have not heard of it and do not carry it in their data base. However other book stores, like Brookline Booksmith in Brookline, MA. sell it, and shelve it in large quantities.They have a sticker on the inside of the book, recommending it to children four years old and up. When I asked them why they carry it, I was told that what is offensive to some is not offensive to others. Hmm. Barnes & Noble carries it as well. As well as New England Mobile Book Fair, in Newton, MA. I am happy to say that Waltham Back Pages Books in Waltham, MA., Stellabella Books in Dedham, MA., and Community Bookstore, in Parkslope, Brooklyn, all do not carry this book. 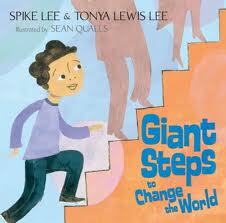 Do you know if this book is being read in your child’s classroom?